Fukagawa Edo Museum (深川江戸資料館) is a museum that restores the building of Edo period. It is located in Fukagawa, Tokyo. The exhibitions of Fukagawa Edo Museum are interactive so that you can enjoy traveling to Edo period. Not only they restore the buildings, but also it restores real life of Edo period. Admission: 400 yen for Adult, 50 yen for under junior. There is a group discount. Closed: 2nd and 4th Monday. Caution: Kids are not allowed to step up to the room. You can play all props., but please be very careful. 1. use Toei Oedo Line to Morishita. 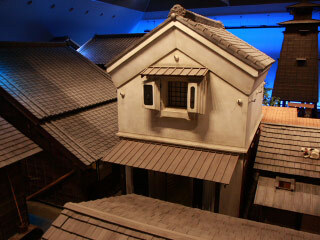 Fukagawa Edo Museum is a museum of restored buildings and life of Fukagawa. Fukagawa was located east side of Edo. It was used to be down town, just like Asakusa or Ryogoku. Fukagawa was also the port town. Nagaya buildings are restored. Nagaya is an apartment in Edo period. Most of Edo citizens lived in this residence. Room of Masasuke: He goes around selling clams. Room of Hideji: He is married with a child. Private School of Syamisen: Teacher also teach reading and writing. Main Strees with Vegetable store, Rice Store, Rice storage, and fertilizer wholesaler. At Rice Store, there is cleaner of brown rice. It was called kara-usu. It restores the pier and hotels of Edo period. There is Fire Watch Tower, and open space to prevent fire from spreading.